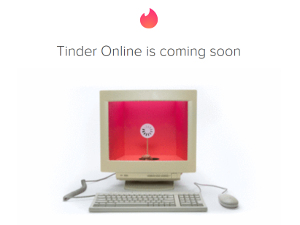 Tinder Online is Coming Soon! Four years after Tinder debuted on mobile phones across the globe, the infamous dating app is finally coming to desktops. "Introducing Tinder Online: a fun, new web experience and your English professor's worst nightmare. Mobile phones not allowed in class? Just fire up your laptop and swipe incognito. Cubicle life got you down? Now you can toggle between spreadsheets and Super Likes in a flash. ‘Not Enough Storage?’ Not a problem," Tinder announced on its official blog. To start, visit Tinder.com from any browser. The experience will look familiar to anyone who has already used the app: login with Facebook, choose your photos, write a bio, and start searching. Tinder is also testing the ability to login via SMS directly from mobile phones in markets where Facebook access is limited. The online experience is slightly more limited than the mobile app experience (for now), and it makes two key changes to its predecessor. Fans of the now-ubiquitous swiping selection method will be disappointed to learn that their favourite feature doesn’t make the cut. Since most computers aren’t equipped with touchscreens, swiping is replaced by clicking, dragging, and tapping the keyboard’s arrow keys. That seemingly small tweak could drastically change the way singles use Tinder, prompting them to be more interested in having conversations than racking up matches. “I wouldn’t be surprised if Tinder’s strategy here was to get people interested in longer term partnerships,” Nir Eyal, author of Hooked: How to Build Habit-Forming Products, told Wired. Though much of the world has gone mobile, Tinder Online makes the dating service available to a wider audience. Places with limited or no connectivity for mobile phones now have an opportunity to use Tinder. And in situations where access a phone can be challenging - like a classroom or an office meeting - the desktop version may provide a sneaky solution. Some have pointed out that Tinder Online can offer a more private dating experience for users who want to keep their searching a secret. By using an incognito window in your browser, there’s no trace of your dating profile left behind. Tinder Online may also be a godsend for users who are desperate to free up space on their smartphones. Tinder Online is currently being tested in a handful of countries: Argentina, Brazil, Colombia, Indonesia, Italy, Mexico, Philippines, and Sweden.